There is a spooky story that has appeared enough times in fictional tales that it seems fixed in our subconscious. It seems that we have all remember the story of the man who met Satan at a country crossroads and sold his soul to the devil. The trade was to become the greatest guitarist that ever lived. Johnson seemed willing to build his fame on the story. And anyone that hears his music, even from the original scratchy old recordings of his time, can recognize his amazing ability as a blues musician. Rolling Stones listed him as fifth in a line of the greatest guitarists of all time. Of course contemporaries including Jimi Hendrix and Janis Joplin appear in that same lineup. An even more eerie twist to the Johnson story is that he like the other great musicians to follow, all died at the age of 27, They included Hendrix, Joplin, Jim Morrison, Kurt Cobain and Amy Winehouse. Because he didn’t achieve fame until long after his death, and because he grew up as a poor itinerant singer and drifter in the south during the depression years, 1911-1938, not much is known about Johnson. That he recorded 29 songs on 78 rpm records and for various recording studios, and Columbia Record Company released all of his songs on one compilation album in 1961 that Johnson’s true genius was ever discovered. 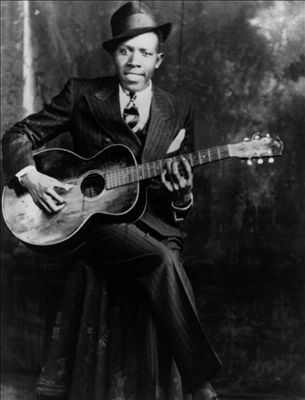 It was the words and titles to the blues songs he wrote and sang that gave credence to the myth that Johnson somehow made a pact with the Devil to achieve the wonderful talent he produced for the world. There was this mystery, and the circumstances surrounding his death “of unknown causes” on August 16, 1938, near Greenwood, Mississippi, that catapulted Johnson to a notoriety unlike any awarded to most entertainers in his field. The story was told that Johnson died a slow and agonizing death after flirting with another man’s woman at a social event three days earlier. Many believe that he was poisoned, although there was never an autopsy. Because he lived in poverty even his grave is unknown. It is thought that he was buried in an unmarked place in a pauper’s field. The irony of his death was that John Hammond, a legendary talent scout of his day, had heard of Johnson’s music and was searching for him with an offer to perform at Carnegie Hall. This was as close to fame as Johnson ever came, and he never knew it had happened. The “pact with the Devil” story was enhanced by Son House, another blues musician who preceded Johnson in the early part of the Twentieth Century. House said he remembered Johnson as a young boy who played a good harmonica but was an “embarrassingly bad guitarist.” When the two crossed paths again, no more than three years later, Johnson had “magically” acquired his amazing skills on the guitar.